The figure of wah pedal in a series of guitar effects, not only as complementary accessories guitar effects. However, a person who’s important to meet the needs of guitar sound when playing solo or form a character on your guitar. The character of sound produced wah pedal sounds very typical. Therefore, while this effect is used, can convert voice signals into sounds like a baby crying. Through this Utopia, Rocktron apply the latest technologies and innovations, a modern-style wah pedal, the sound character remains ‘vintage’ or ‘classic’. For physical construction, Rocktron Utopia rectangular box-shaped, supported the construction of the chassis of a thick steel plate. The design of it makes this pedal very ready for strenuous physical exploration. Outward appearance also showed its sturdiness. Clad in a silver finish with black rubber coated as a footrest pad. Thus, making footrest feel more soft and comfortable to linger in this effect. Then there is the writing Rocktron logo on each side provide a clear identity for this pedal so easily recognizable. For the operation, Utopia provides a switch on / off, input jack, output jack, 9 volt adapter input as well as a 9 volt battery box. 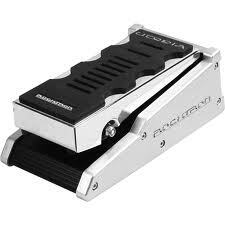 Its performance the swing motion wah pedal is very expressive and responsive. Results of the sound was heard clearly and condensed character of his vintage wah. It is suitable to be played in a variety of musical genres such as blues, pop, funk, rock, and even metal though. With the addition of sound effects behind distortion, his sound character will be more viscous and thick sounding. Try some compositions like “Voodoo Child” (Jimi Hendrix), “Summer Song” (Joe Satriani), “Sweet Child O ‘Mine” (Guns’ N Roses), or “Enter Sandman” (Metallica) using this Utopia wah, and feel distinctive character of his voice. Very feasible to be used as weapon in your pedalboard menu. In addition to wah guitar effect pedal, Rocktron Utopia is also available for the bass player. Read also “Review: Peavey AmpKit Link HD Digital Guitar Interface” and another gear reviews. Hopefully the article of Review: Rocktron Utopia Wah Guitar Effects Pedal useful for you.